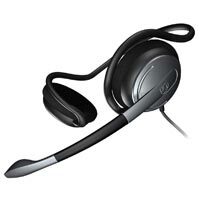 Bring great stereo sound to your computer with the PC 141 headset and truly enjoy your music, movies and VoIP conversations. The stylish neckband won"?t get in your hair, and the fold-up microphone is perfect for travel. Ideal for enjoying music, movies and internet conversations wherever you go, the PC 141 stereo headset will never cramp your style. Lightweight and comfortable, the headset has a neckband so you can wear your hats and hair any way you like. But it"?s not all about looks. An advanced, noise-canceling microphone ensures high-quality speech clarity, so you can enjoy VoIP calls without raising your voice. Twin speakers deliver awesome stereo sound, and block out background noise so you can always concentrate on what you"?re doing. And for the ultimate in portability, the fold-up microphone makes the headset easy to pack away, giving you powerful sounds wherever life takes you.